What I love about LRF is just how versatile it can be, last summer I would often nip out of an evening with just a rod, reel and my shoulder bag and squeeze an hours fishing in and more often than not be rewarded with a couple of species for my efforts. So far this year I have not had so much luck, it has been a slow LRF year for me and the mini species I love to catch are taking way too much time to become active for my liking, so, out of desperation (and buzzed by a new LRF rod purchase!) I thought I would try for one of my long-term targets, an LRF Mullet. 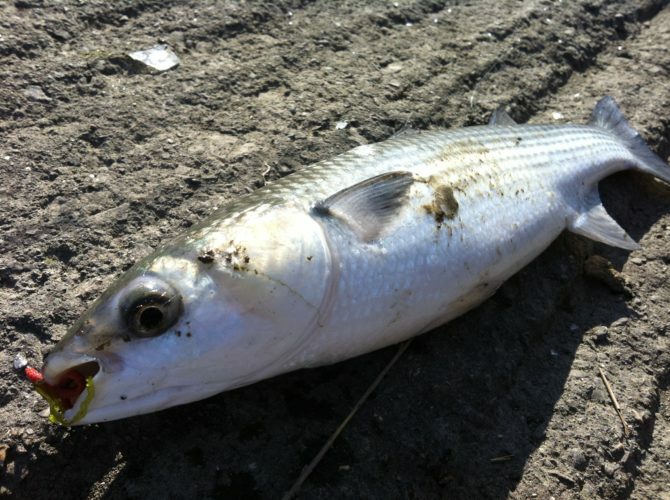 A call from a friend told me the Mullet had started to show at the top of Langstone/Portsmouth harbours so more in hope than expectation I wandered down to a local mark to see what if I could experiment with a few plastics. A take would be a success. A short walk from my car and I saw a dozen or so mullet mooching around as they do, my mind wandered to fruitless attempts over the years with bread and groundbait etc but if I blanked at least I could rule some stuff out. The go-to lure if I am speculating is generally a Power Isome worm so I chose a medium size in red and attached it to a 1g Ecogear Shirasu jig-head just to give me a touch of weight to cast. So I followed the group of mullet (not sure what the collective term for mullet is, I'd like to think its a gathering rather than a shoal!) up and down casting my lure over the fish and slowly retrieving. All the time the mullet were cruising up and down they were not interested at all, could not get any follows let alone takes but all of a sudden they stopped and started to graze and switched from not interested into VERY interested. As they fed I continued to cast and retrieve until one of the Thin-Lipped broke away from the 'gathering' and followed my worm imitation. I only had a few metres of water to play with so I slowed the retrieve to give me some more time and watched as the Mullet opened up his mouth and sucked the lure in almost under my feet, then I had the realisation of what on earth am I going to do with it now! My new Graphite Leader Calzante EX LRF rod was certainly being tested and coped beautifully and the little Daiwa Gekkabijin fixed spool was getting treatment it had not had with Gobies and Blennies before! 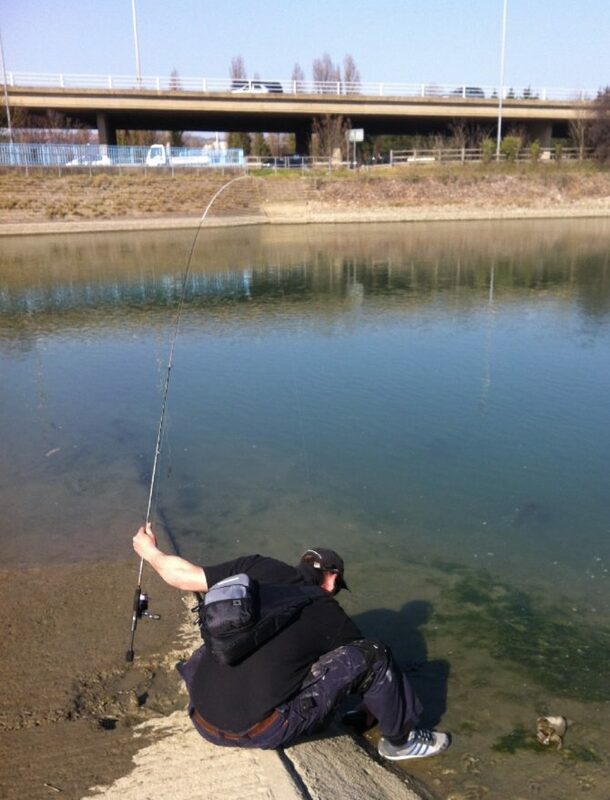 I eventually managed to walk the Mullet 30 yds to a slipway where I could reach in and grab the fish and a helpful passer-by took a photo as I landed it, I am not sure it counts as street fishing but I am basically behind a slip road off of the M27! It was not a big fish, around a pound and a half but worth its weight in gold as far as LRF is concerned, I know they are on many anglers LRF need-to-catch list and I consider myself very lucky to have caught one the first time of asking. Needless to say the Mullet were spooked and despite a few more casts I knew they were not coming back for a while so I left them a very happy man. I will try again when a few more fish show and try to find the BIG Mullet that congregate around the harbour in the summer, I have a feeling they may not be so easily fooled.....but LRF continues to surprise me, fingers crossed.